The Women's Table in front of the Sterling Memorial Library. 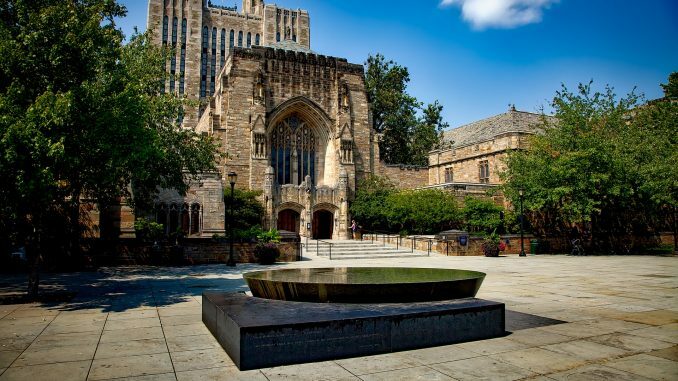 The Women’s Table at Yale was designed by Maya Lin, the famous alumni best known for designing the Vietnam War Memorial in Washington in 1982, and is the most visible sign of the commemoration of women at Yale. The Women’s Table was commissioned in 1989 by Yale President Benno Schmidt for the 20th anniversary of the coeducation of Yale College, and Lin took the opportunity to mark the female students registered each year since the inception of Yale in 1701. The granite blocks of the Women’s Table form a tribute to the women that have made the university what it is today. A string of slowly growing numbers denote the female students if Yale; as the numbers grow from a string of zeros deep in the dark center of the monument, they spiral out with the passing of each year till the reach the edge of the table filled with babbling water. Lin’s Women’s Table resides in front of the Sterling Memorial Library, which is considered to be the centerpiece of the Gothic Revival campus. With such a prominent place for her monument, Lin has left a note etched in stone of not just how far the women of Yale have come, but how far they have to go. The total number of women enrolled at Yale had never exceeded the total number of men. The numbers end in 1992, the year before the sculpture was completed. The Silliman sisters actually registered for the School of Fine Arts when it opened in 1869. Location: Rose Walk, by Sterling Memorial Library. Women were allowed to sit in on classes in the 1800s but were not allowed to participate. They were known as silent listeners. The Women’s Table has become a popular site of graduation photos for the women of Yale. The largest number on the table is 4,947, representing 1992.